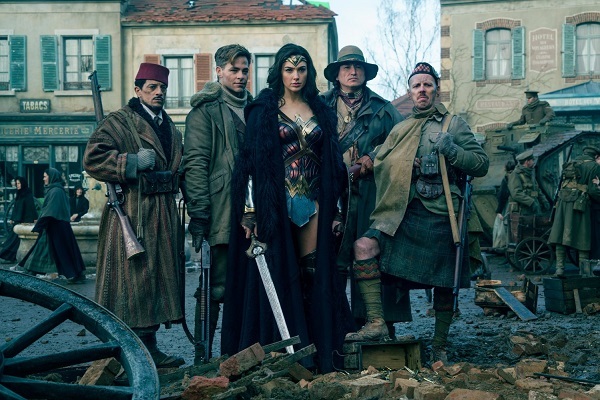 Director: Patty Jenkins. Cast: Gal Gadot, Chris Pine, David Thewlis, Danny Huston, Elena Anaya, Robin Wright Penn, Connie Nielsen, Saïd Taghmaoui, Ewen Bremner, Lucy Davis, Eugene Brave Rock, Lilly Aspell, Emily Carey. Screenplay: Allan Heinberg (based on a screen story by Zack Snyder, Allan Heinberg, and Jason Fuchs). Twitter Capsule: At last! A long, heavy, visually banal, shakily scripted superhero movie, strangling its putative appeal. Compliiccit. Second Capsule: I so wanted to like Wonder Woman and expected to, but I really hated it, wish I hadn't seen it, and think a lot of people are acting crazy. VOR: ③ The movie has touched a nerve; it obviously speaks to needs and gaps I can't relate to. But it's dismayingly like every other superhero film.